Hawaii Sen. Mazie Hirono (D.) said Democrats could keep the open seat on the Supreme Court vacant until after the 2020 election if Brett Kavanaugh's nomination collapses and Democrats regain control of the Senate in November. Hirono pointed to the long vacancy of Antonin Scalia's former seat as a justification for holding off on confirming any nominee from President Donald Trump. When Barack Obama was president and Republicans held the Senate, Sen. Majority Leader Mitch McConnell did not hold a vote on Obama's nominee Merrick Garland, and Hirono said Democrats could do the same if they had the Senate. "I think we’ve had those kinds of vacancies before, and we certainly had over a one-year vacancy with Merrick Garland," Hirono told Politico Magazine. "So the world does not come to an end because we don’t fill all of the nominees." In 2016, Hirono criticized her Republican colleagues for not considering the nomination of Judge Merrick Garland to the Supreme Court. "It is unprecedented to announce unilaterally that no part of advice and consent will occur until after an election." 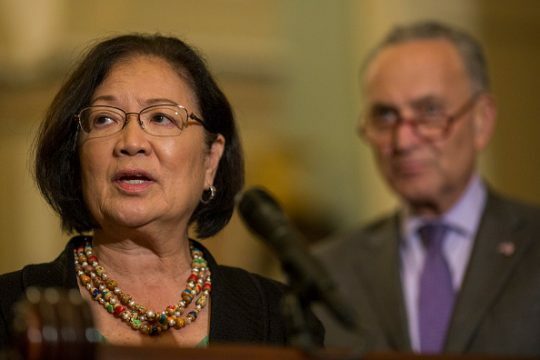 "There is a law enacted nearly 150 years ago that says that the Supreme Court shall consist of nine justices, which also presumes that when a vacancy occurs, the President will nominate a replacement and the Senate will provide advice and consent," Hirono continued. "In my view, this law is violated when Senate Republicans say that it’s ok to leave a vacancy unfilled for over a year." Kavanaugh’s nomination has been delayed in the wake of an allegation by Christine Blasey Ford, a California professor, that he attempted to sexually assault her while they attended high school in the 1980s. Kavanaugh and Ford are both set to speak at a Senate Judiciary Committee hearing Monday. Hirono said she believes Ford’s story. "These are serious allegations. She has a very credible story. I believe her. And now we have to do more than say, ‘Well, look at the timing!’ and ‘Well, it’s all politically motivated!’"
This entry was posted in Politics and tagged Brett Kavanaugh, Mazie Hirono, Merrick Garland. Bookmark the permalink.